I know I've been gone for a while. I may write soon about what I've been up to, but I can't promise anything. I have been updating the Fun Mama page on Facebook with brief snippets, if you want to be in the loop. One of the things I have been doing is writing articles for the Spencer Magnet, my local newspaper. I am planning to post links to those articles here, but I haven't gotten to it just yet. So there may be a several posts about those articles pretty soon. Last week, I went to a cookie exchange for one of the Homemaker clubs that I joined in our county. I ended up writing about that cookie exchange and sharing the recipe in my column this week. I'm crazy about these cookies, and I hope you'll enjoy them soon. For some reason, the online version of the article didn't include the recipe, so I'll post it here too. But please feel free to check out the article with tips on having a cookie exchange. Preheat oven to 350 degrees. Beat together shortening, butter, sugars, egg, water, and vanilla until creamy. Add oats, flour, salt and baking soda. Mix well. Add pecans, cherries and chocolate chips. Mix well. Drop by rounded teaspoonfuls onto cookie sheet. Bake for 10-12 minutes. Makes about 5 dozen. Last night on the Fun Mama Facebook page, I mentioned my little biscuit fiasco at dinner. I have been making biscuits since I was a teenager, if not earlier, and I still screwed up a simple recipe. That what happens when I'm distracted. Fortunately, the recipe is so simple that it seems to have not been a problem. The biscuits were pretty good anyway, and rose beautifully. After a bit of conversation about my biscuits and cornbread, someone asked if I would mind sharing the recipe. As they aren't really mine, I don't mind a bit. I got both of these recipes off the back of White Lily flour bags. I love White Lily and use it almost exclusively, unless I'm using whole wheat flour (or a recipe that specifically calls for something else). I guess you could use something else, but especially for the cornbread the brand is important. I would like to try to make some real, corny cornmeal cornbread sometime, but I love this recipe so much that I'm willing to wait a while. Heat oven to 425 degrees. Place and 8 inch of 10 inch heavy skillet that has been coated with vegetable oil in oven to heat. Or, coat an 8x8x2 inch baking pan with no-stick cooking spray. Combine all ingredients stirring just until moistened (batter will be lumpy). Pour batter into heated skillet or pan. Bake for 20 to 25 minutes for 10 inch skillet or 25 to 30 minutes for 8 inch skillet or pan. Remove from pan and serve. I nearly always use the larger amount of milk - and try to always use buttermilk. I use the oil, not shortening - not sure about using other kinds of oil. I've thought about trying coconut oil for other things - wonder if it will work here? As for the sugar: Sugar is very controversial when it comes to cornbread. Down South, where I'm from, you don't use sugar. Up "North," where I live, people make almost a corncake instead of cornbread. I like to use about a handful of sugar. The people in the south don't seem to notice and rave over it. The people in Kentucky don't mind that it's not as sweet as they expect. I don't actually measure the sugar, just eyeball it. I use a 10 inch cast iron skillet. I most often make this to accompany my vegetable soup, although it's good with any fresh vegetable meal. Heat oven to 500 degrees. Measure flour into bowl. Cut in shortening with a pastry blender until lumps are the size of peas. Blend in just enough milk with fork until dough leaves sides of bowl. Turn dough onto lightly floured surface. Knead gently 2 to 3 times. Roll out dough to 1/2 inch thick. Cut using floured 2 inch biscuit cutter. Place on baking sheet 1 inch apart for crisp sides or almost touching for soft sides. Makes 12 2 inch biscuits. Where I screwed up was that I I forgot to cut in the shortening before adding the milk. So I was left kneading a ball of goo. I always do the cutting in and blending with my hands instead of a party cutter or fork. I like the texture better, and I can tell what's going on better. I think you could use butter instead of shortening, but I've never tried. I like to eat the biscuits split with honey or jam. I always used blackberry jam as a kid but the blueberry-lime jam I made a few weeks ago is yummy too. Biscuits go great for breakfast or with fried chicken, sausage, or just about any other country cooked meal I can think of. I love blackberries. I fell in love when I was very little. Daddy sometimes had blackberry patches when I was growing up and sometimes not (the garden is on the edge of a swamp which I think had something to do with it). When he did not have cultivated blackberries in our garden, we spent the summer seeking wild blackberries all over our neighborhood. Wild blackberries are funny. Sometimes we had some on our propery, but more often than not those were on the pipeline and got cut down by the electric company (or whoever "owns" the pipeline - I was always a little fuzzy on that). Sometimes we would find them on the side of the road, and our whole family would go picking. Where I grew up, a lot of the land is either farm land or owned by a hunter in Atlanta. No one cared if we picked a few wild blackberries. I particularly remember going with my Daddy when I was about eight or nine. My memory is a little fuzzy, but I feel pretty sure that my hair was in a French braid and I was telling him all about the Little House on the Prairie book that I was currently reading. The memory is all wrapped up with me feeling like Laura. I also remember picking blackberries with my sweet Grandma Bozeman. She loved blackberries (although she didn't love the seeds), and made sure to come pick berries at our house during the summer. I wish she was here to pick blackberries with me now, and complain about the seeds getting in her dentures. Regardless of where we got the berries, we always had enough for a lot of blackberry cobbler and a lot of blackberry jam. And there were bags and bags of blackberries in our freezer. Our motto when preserving the harvest was to preserve enough in case the next year's crop was not good. That explains how both our freezer and my grandparents' freezers were full of blackberries (and how we always canned over 200 quarts of green beans, but that's another story, really). While I was working on the article Monday, I decided to run over to the farm where I've been picking this summer, and see if they had any berries left. There weren't many, but I was able to get three pounds. That night, I finally tried the recipe that I've been mulling over all summer. I wanted to make a blackberry crisp. 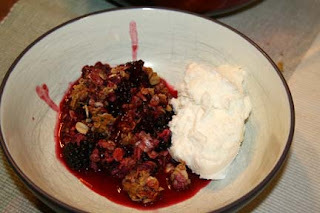 I've never had blackberry crisp, nor had I heard of it. I grew up eating blackberry cobbler (really, it's a deep dish pie because we use a bottom crust, but I won't tell if you won't). I love it, but rolling out pie crust is one of my least favorite kitchen tasks. Well, it's way behind washing dishes, but it's still not my favorite thing to do. 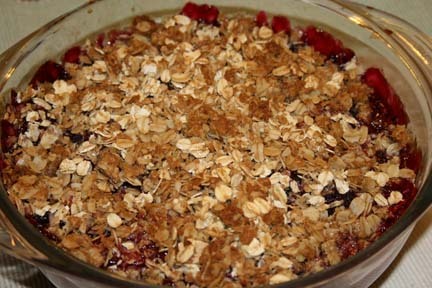 I looked online and couldn't find a blackberry crisp recipe that I liked, so I adapted an appple crisp recipe instead. I hope you enjoy it. For topping, combine all ingredients into mixing bowl. With your hands, combine the ingredients until the butter is well mixed. Put topping over the blackberries. Bake at 375 degrees for 30 minutes or until berries are bubbling and topping is the level of doneness that you prefer (we don't like ours crunchy). Here is where I confess that I didn't measure at all. I put the blackberries in my baking dish until it looked like enough, then transferred them to the mixing bowl. The rest of the ingredients are to taste. Only add more sugar than you think you'll need if you don't want it to be too tart and the flour is a thickener, so that's personal preference too. Also, I suppose you can use ground nutmeg, but I haven't bought it in years. I keep whole nutmeg in the house and grate it when I need some. The Ultimate Ice Cream Book by Bruce Weinstein - Contains recipes for blackberry jam ice cream and blackberry sorbet. I have this book and use it a lot. Great ice cream recipes. Ball Blue Book of Preserving - The edition on Amazon shows that it is out of print, but I know I've seen it in stores recently. This has so many interesting blackberry recipes. In addition to the usual jam and jelly, there's a liqueur sauce, and mulled vinegar. Southern Living 2009 Annual - Southern Living Annuals are always fun. I've been collecting them for about ten years. The 2009 annual has a blackberry buttercream that is tasty on pound cake - I used it at a 4th of July picnic. There's a recipe for blackberry cornbread that is intriguing too. In a Pickle, In a Jam by Vicki Wilder - This book is by the Creative Home Library and was published in 1971. If you find it, grab it. If you find two, let me know. I saw this book at my local library and picked it up on a whim. I thumb through it constantly. I'll go more in-depth on it in another post, but among other things, it has a recipe for blackberry cheese. Blackberry cheese! This is a non-dairy product, and I am eager to give it a shot. Yum. What's Cooking America website - Lots of blackberry recipes, hints and tips. Pick Your Own website - This site is a great resource not just for u-pick locations, but recipes, canning suggestions, and all kinds of information on produce. This is a link to the blackberry page. What do you like to do with the blackberry harvest? My latest article for the Spencer Magnet, "Quilter's talent runs free," is available for viewing. I had such a wonderful interviewing Jan Darnell, whose quilt will be on exhibit at the National Quilt Museum in Paducah, KY this fall. She was gracious enough to invite me into her home, and show me not only her horse quilt that you will see in the article, but also several other quilts that she has made or quilted for others. She was also patient with my three year old daughter, which is always nice. I know the average reporter (although I'm not sure that word describes me) doesn't take her children to interviews, so I am especially thankful that it has worked out for me to take her with me so far. I hope you enjoy the story. If you get a chance, take the time to visit the exhibit "A Horse's Tale" in Paducah. Darnell's quilt is amazing in person, and I'm betting the other quilts will be beautiful too. Since last summer or maybe before that, I have read about different bloggers deciding to go shampoo-free. It sounded kind of gross, until I realized that it didn't mean going without hair washing. There are other, cheaper and possibly cleaner ways to get hair clean than to use shampoo. Who knew? I first tried my own experiment in April. I lasted a week, and then I got to Mama's house and her shampoo smelled So good. I couldn't resist. The first week or two is the hardest, and since I hadn't really gotten the hang of being shampoo-free, it took me a while to try again. As I said, the first week or two is the hardest. Your hair is getting used to its own oils again, and over produces. I was getting used to a different texture, and I probably over washed. I missed the lather sensation. It just took some time to get used to the whole process. After about two weeks, the oil production started to slow down, and I could go several days without washing my hair with no changes in cleanliness. This was a huge shift. I normally wash my hair every day or it gets greasy and disgusting. I was absolutely shocked when that stopped happening. Another thing that surprised me is that I can now rinse my hair with water between washings without dire consequences. When I was using shampoo, if I planned to shower without washing my hair, and my hair got wet anyway, I had to wash it. Getting my hair wet made it even greasier. Now, I can rinse it to keep it clean, and I don't have to use the baking soda every day (since baking soda can be drying). I started adding a sprig or two of lavender to the vinegar solution because I hate the smell of vinegar. It helps a little. I read somewhere that adding essential oil can help, too, and I may try that. My one issue with the whole thing is that I like the smell of shampoo and I don't like the smell of hair. I've gotten used to not using so many man-made fragrances, but I really like herbal shampoo smells and I just don't get that herbal smell even from my lavender sprigs. If this sounds intriguing at all, here are a few places to do some research. Info: Shampoo Free @Baby Slime - This is the post I turn to for all my questions about going shampoo free. Every once in a while, I have to go back and read up on it. How to Clean Your Hair Without Shampoo @SimpleMom - This post also has a lot of useful information. 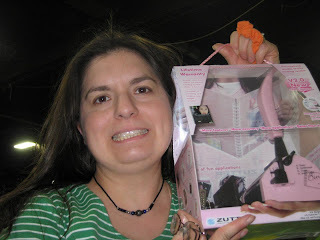 Shampoo-Free: Why and How @SortaCrunchy - Another mom discussing why she went shampoo-free. Weekend Bonus Post for Frugal Beauty Hacks @What Do We Do All Day? - One blogger who decided to get rid of excess packaging and chemicals and save a few bucks at the same time. Green Cleaning And Body Products @The Artful Parent - Discusses several homemade body products, plus her method of baking soda shampoo. I think when I cut my hair again, I'll go with her direct approach. Melts for the Tub @Angry Chicken - This is probably the post that started it all for me. I know she only briefly mentions going 'poo-free, but I thought the rest of the post was interesting enough to include. So there you have it. I hope I've inspired you to save some money while avoiding nasty chemicals in your shampoo. Have you tried this before? How did it go? For those of you who have asked or who are joining me through the Spencer Magnet, I am posting the information for RiverSong Farm and their chicken dinner workshop. Their next chicken dinner workshop will be on Saturday, July 31 from 4-7pm. In addition to being a great way to get fresh, free-range chicken for dinner, this workshop has the potential to change the way you look at your food. I will write about my experience and have a link to my article for the Spencer Magnet soon. Thank you! The farm's phone number is listed under contact information on the website. Please call to reserve a spot for the workshop. My experience with rhubarb is limited to the one time a docent at the Tullie Smith House at the Atlanta History Center made a strawberry-rhubarb pie when I was an intern there. I remember it being good, but I haven't sought out rhubarb since then. After writing this story, and seeing how beautiful the plant it, I'm considering putting in a rhubarb bed! Rhubarb is sour, so most recipes call for it to be used in desserts. That way sugar and fruit can act as a counter balance to its tartness. I've also heard people describe it as counteracting the sweetness of other things. For the last two months, I have joined in with the Patchworker Quilt Guild in my county. They are part of the Homemakers Association out of the county extension office. Among other things, that means that my annual dues of $7.50 pays for my membership to the guild. If you've ever considered joining a quilt guild, you know what a big deal that is. Guilds can be very expensive! Part of the reason I've attended these meetings is because I wanted to get a feel for the club for an article for the Spencer Magnet. (Read "Circle of Friends" here.) But I wouldn't be writing these articles if I wasn't interested in the subject. My interest in quilt making goes back many years. My maternal grandma and great-grandma both made quilts that covered my family when I was growing up. These quilts were beautiful, but utilitarian. They consisted of squares cut out of left over fabric or old clothes and are mostly made of polyester fabric with a bed sheet backing. I decided when I was about 19 that I wanted to learn to quilt too. Grandma gave me a pattern and helped me find some fabric - including some of her scraps and some of my brother's old shorts - and we started cutting out the pieces. Unfortunately, Grandma got very sick and passed away soon after we started the project. I've done bits and pieces over the years, but my quilt still isn't finished. My Mama and I took a quilting class together in the fall of 1997. I have both of our unfinished quilts now. Hers is a little more finished than mine. I chose my colors to match my bedroom at the time, so it's a little outdated now. I still would like to finish it because it is pretty. I also purchased enough fabric to make my daughter an Olivia (the pig) quilt for her bed. I've gotten as far as cutting out the blocks, but now I'm a little afraid to sew the flannel together. Apparently, I do really need this quilt guild! 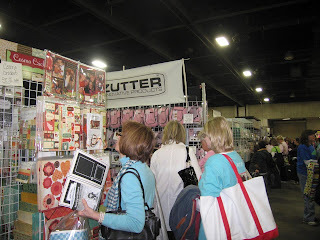 I am thrilled to find a group of women who are interested in quilting and in learning and teaching others to quilt. I am accepted by the group. The women do not mind that I bring my 3 year old daughter, and compliment her behavior. I am by nature fairly shy, and even when I am going somewhere with the intention of meeting new people, it can take me some time to get my nerve up to approach anyone. I was pleasantly surprised by the women who remembered me on my second visit and came over to say hi. I hope that these articles will encourage local women to check out our Homemakers Association, but I also hope that my experiences will encourage those of you who are not local to look into clubs in your own area. I have heard rumors that some homemaker clubs expect members to be a certain kind of women. I believe this organization is important enough, though, that I encourage you to look into it. If you don't find what you're looking for, talk to your county extension agent about starting a new club. It doesn't hurt to ask. I forgot to mention that about a month ago I started writing a second article each week for my local paper, the Spencer Magnet. I now write an article about a local recipe each week, in addition to the feature articles. Below are links to each of the articles up to now. I'll try to post these at least once a month so you can experience these great recipes too. I joined the Homemaker Association in my county in March 2009. I had taken a class through the county extension office program known as SOS (Sharing OurSelves) on sewing, and the teachers mentioned that they had a sewing club if you joined the association. It was only about $7 to join ($7.50 now), and I really needed the help. I didn't go to sewing club every month, but I really enjoyed it and learned a lot when I did get to go. The club members were instrumental in my finishing my daughter's Halloween costume on time and in wearable condition. I was invited to join the Junior League by an alumna of my college when I first moved to Kentucky (because we don't have an active alumnae association) and declined. Who wants to wear a suit and sit around having stuffy teas? I don't know about the Junior League, but that is certainly not what I found when I went to the Loyal and Waterford Homemaking Clubs. I found ladies who care about each other, who are part of one another's lives. Women who know how to get down and have fun, but are active in the community. They raise money for scholarships, help the elderly, and make curtains for the school. Most importantly, they do not judge. Some of them are lifelong homemakers (or "housewives"). Some of them worked outside the home, and joined the club when they retired. Some of them still work outside the home and meet with the club when they are able. They don't all like housework or even crafts. They all believe that making the home inviting is important and that the home is an important part of the surrounding community. The Homemakers Association is an outreach of the county extension program, and is available nationwide. Not all counties have multiple clubs, and from what I can tell, not all counties even have Homemakers clubs. They are a great way to plug into your local community, and get involved on a regional and national level, though. Especially if you are in a rural area, this may be something you'll want to look into. My husband was recently gifted with some homegrown cucumbers, and we were at a loss as to what to do with them. Then we remembered that we had grown cucumbers of our own in order to make pickles. I thought it might be a good idea to to practice pickle making on these cucumbers before ours have even gotten started good. While I still have not made my own pickles (I'll let you know when I do), I was delighted to be invited to Lora Cheek's home to watch her make pickles with her mother one morning last week. When I arrived, they had just sanitized the canning jars and were cutting the cucumbers. It was fascinating to watch cucumbers go from bright green to olive as the vinegar mixture was added. Most thrilling of all was hearing the jar lids "pop" as the jars sealed themselves after 10 minutes in a water bath. I was inspired by Cheek's use of a crawfish pot as a water bath canner, and a glass measuring cup for pouring the vinegar mixture into the jars. It made me realize that I didn't need a lot of equipment to can anything. I have some jars and a pressure canner. Other things can be improvised. My daughter, who normally is very shy around strangers, warmed up almost as soon as we got out of the car. The dog, a beagle/dachshund mix, came up to her and licked her face. She started laughing and made herself right at home, at one point actually crawling into Mrs. Cheek's lap to rock with her! I started to wonder if a different kid got out of my car. Preparing & Canning Fermented Foods and Pickled Vegetables - I can't say enough about using your local extension office as a resource. I called the Family Resource agent, and she left a booklet on all kinds of food preserving at the front desk for me. I only live a few miles from the office, but I could have asked to have it mailed. Or you can always look up your state extension offices brochures online. Good Eats: The Early Years by Alton Brown - This book is such a fabulous resource! I need to remember to look through it when I have questions about nearly anything food related. (Can't wait for volume 2 this fall.) Anyway, the pickle chapter explains the history and science behind pickles in a fun way (I wish chemistry class had been this much fun). It contains 2 recipes for refrigerator pickles, but explains the differences between those and fresh pack and fermented pickles. Better Homes & Gardens New Cook Book - contains fresh pack recipes, and explains common problems. Reader's Digest Homemade - Contains several pickle recipes. Southern Living Annuals - I have almost every one since 1998, and they of course contain pickle recipes (cause us Southerners love our pickles). Ball Blue Book of Preserving - This is the grandaddy of all canning books. Originally published in 1909 and updated every few years (although I can't find a difference between this year's edition and my edition from 2004 except the new one is prettier). Peak Food: Why a Local, Seasonal Diet is Never Boring @Leda's Urban Homestead - The maple bread & butter pickles she made sound intriguing. Pickles @ A Mountain Mama - I read this post of Kelli's last summer, and was fascinated by this method of making pickles. I also love her basket. Spicy Pickled Carrots @ Wisdom of the Moon - These are so pretty! Plus I like that she combined several recipes to make her own. Canning Pickles @ Little Birdie Secrets - Detailed description, plus photos of the steps. A great tutorial. I do participate in Amazon's associate's program. This means that if you click on one of these links and then purchase that item, then I will receive a small percentage. This does not cost you anything extra, but does help support this website. Thank you! Pickyourown.org - Amazing resource on picking fruits and vegetables and preserving them. Includes five strawberry jam recipes. I also like to find new things to do with strawberries. I've mentioned my strawberry cake recipe before. I searched online for strawberry cake recipes until I found one I liked, then I tweaked it and used a strawberry cream cheese icing I'd found with a different cake recipe. We also like strawberry pie, and have had two in the past few weeks. I had my first strawberry pie when I was nine years old and visiting my mom's aunt. It was a revelation. What are some of your favorite things to do with strawberries? Disclaimer: I am now a part of the Amazon Affiliates program. That means that if you click on one of the books I've highlighted and then purchase that book, I receive a small referral fee. edited to add: I do actually own each of the books that I mentioned (except the Ball book and the Better Homes and Gardens, which I have out-of-print editions of). I use them all, and find them to be good resources. Clicking on these links does not cost you anymore than if you didn't, but it is an easy way to support this site. Thank you. What do you like to do to cheer up your friends? We have been busy in our garden lately. We finally had the opportunity to get our garden beds laid out, and we've put in seeds and the plants that we've grown from seed. It is so cool to watch a seed grow from this tiny, seemingly inconsequential thing to a plant, with leaves and everything. And, eventually, there will be food in my backyard. We've already been eating kale and lettuce that we're grown. We're hoping we get some broccoli soon. In addition to gardening, I have also spent a lot of time lately getting to know other people in my community. I've lived in this house for five years, but barely knew anyone outside my neighborhood. I thought I had mentioned before that I joined our county's homemakers club that is sponsored by the county extension office, but I can't find any post about it. Anyway, I was only going to the sewing group part of the club (there are nine different homemakers clubs with various themes), but decided about a month ago to start going to some of the other meetings. So in the past month, I have attended at least five meetings, and I love getting to know the women at these clubs. I have been welcomed and made to feel like a member of the group. When I run into women I've already met, they hug me and tell me they're happy I came. They make me feel like I belong. This morning, my daughter and I went to the quilt guild. There were about twenty women there and I had only met three of them. Abigail usually displays quite a bit of stranger anxiety when we're with people we don't know well or don't see often, and today was no exception. She sat in my lap with her head on my shoulder for forty-five minutes, until I decided it was time to go to the local library for their summer reading kick-off. They were having a puppet show, and since Abigail has never seen one, I thought she would enjoy it. When we got there, the show had already started and the room was dark. The city mouse and country mouse kept sneezing and flying off stage as they screamed. Within a few minutes, she was asking to leave. I told her if we left then we were going back to the quilt guild, and she said she wanted to go. When we got back to the extension office, she started making friends. Abigail got her doctor kit out of her backpack, and started going around the table giving the ladies shots and pretend suckers. She checked heartbeats and ears. She patted ladies on the cheek and rubbed their arms. I am so thrilled that she is starting to feel comfortable with the homemakers group too. After the quilt guild we came home for lunch and I put Abigail down for a nap. After her daddy got home from work, I left again to try out the gardening association which is also part of the homemakers club. I had planned to take her with me, but she decided she wanted to spend time with her daddy instead. This turned out to be a good thing, since the garden club actually had a lecture on a member's back patio. I'm not sure that my girl could have stayed still through the whole thing. I loved seeing the gardens and getting ideas for my own. I was even sent home with a couple of new plants - a Japanese iris and a yarrow. How is your garden doing? Or do you have other spring-time activities that you enjoy? When we moved into our house several years ago, we noticed an unusual (to us) phenomenon. There were little birds in our neighborhood that resembled sandpipers, and they built their nests in our driveway. Our driveway is gravel, not concrete, but I had never heard of a bird that would lay its eggs in such a dangerous place. It took me a while to figure out what the birds were, but I finally learned that they are known as killdeer. Every year, we have watched the birds build these nests. When killdeer feel that their nests are threatened, they will pretend to have a broken wing and hop in the opposite direction of the nest, and we observe this behavior each time we go to the mailbox in the spring. I watch the nests and wait to see babies. Each time, I was disappointed to find a completely empty nest after weeks of waiting. It broke my heart a little each time. The poor birds spent all that time caring for the eggs only to have a predator get them at the last moment, over and over. I began to wonder how on earth the species continued to survive. Tonight, we had the surprise and pleasure of arriving home to find baby killdeer running across our driveway. I checked the nest, and yes, it was empty. I haven't found any information on nesting habits, but my guess is that the baby birds eat the shells for the calcium? If you know, please fill me in! It was so cool to watch the baby birds run around, and their parents coral them. I wish I could have gotten a picture! Last week, I wrote an article about Edible Wild Plants that was published in my local paper, The Spencer Magnet. My plan was to write here about my personal experiences with eating wild plants. I had grand plans to make cookies and syrup from dandelions. My daughter was so excited, she couldn't stand it. So, guess which weed decided to spontaneously all but disappear from my yard in the last two weeks? Seriously. Apparently all it takes to get rid of dandelions is to decide that you have a use for them. I was digging them and throwing them aside for weeks before that. I'm hoping the dandelions will be back soon (don't tell my husband) because I really want to try that cookie recipe. I'll be sure to share my experiences when I do. I distinctly remember having a lot of dandelions in our yard during Memorial Day weekend last year, so I'm expecting more soon. (I understand it may be weird to distinctly remember something like that - we had a party, and I remember a little girl picking them). I do have some experience with eating wild plants, although I'm sure it's not something most people would lump in with eating dandelions and clover. When we didn't have domesticated blackberries in our garden when I was growing up (which happened from time to time), we would pick the wild ones from the roadside. They were smaller, but I usually didn't notice that. I'm sure there's a flavor different of some kind, too, but I don't remember it. The wild blackberries made wonderful jam and cobbler just the same. I know that lately I've only been writing about the articles I'm writing elsewhere. Sorry about that! I hope that you're enjoying reading anyway. As I've mentioned, April was pretty hectic for me. This means that I didn't get around to linking to my April posts for my blog, Mommy Brain - Because Postpartum is Forever on the What to Expect website. I hope you enjoy. Let me know what you think! I mentioned yesterday that I had an article published in my local paper, The Spencer Magnet. I didn't have a link to the article until this morning, though. If you are interested, you can now read Candy Making. I'm excited about this opportunity. I hope that you'll find my articles to be a helpful addition to what you already read here. Today I have an article published in my local paper, the Spencer Magnet, about a candy making class that Abigail and I took. I hope you'll take the opportunity to read Candy Making. If you are visiting after reading the article, welcome! While the class wasn't intended for for children, my three year old daughter was entertained and was even able to mold her own bunny mint with the help of one of the teachers. Candy making can be a fun indoor activity for children and there are tasks available for nearly any age. The main priority is to have fun, but it can be a huge confidence boost for a child to be able to make something others will enjoy. There are several candies that call for the center to be rolled into a ball before being dipped into melted chocolate (including Martha Washington candy and peanut butter balls). Even small children can be shown had to roll things into a ball (much like playing with play dough). Children from toddlers to teens can participate in the dipping process. If melting in the microwave, children can stir the candy between each session in the microwave. Chocolate should not get hot enough to cause a burn (it would ruin the chocolate). Once the chocolate is melted, children can help dip the balled candy or pretzels or whatever you happen to be dipping. Children can put peanut butter on crackers (Ritz is our favorite) before sandwiching them and dipping them into chocolate. For the mints (like my daughter made), the dough is easy to mix, and the children can put it into the molds. This recipe is similar to the one we used, and demonstrates how the mints can also be rolled into a ball and flattened instead of put into a mold. Candy melts are relatively cheap and will store for a long time. I've purchased them on sale and saved them for a rainy (or snowy) day. We made candy coated pretzels during a snowstorm this past January. Sometimes it's possible to find candy melts or candy kits on sale after a holiday, and can be stored until you need a fun, simple activity for the kids. I hope these suggestions have sparked ideas for you to make candies with your children. So, last night I decided that we should have some springy vegetables. We buy chicken breasts in bulk, slice them for Asian dishes, and then freeze them. So all I had to do was let the chicken thaw, and then chop my vegetables. I scored locally grown asparagus and green onions at the market a mile from my house, and picked up a zucchini while I was at it. I already had some carrots and onions and a can of water chestnuts. I also decided to use some of the kale that we're growing on the front porch. Once the chicken was cooked through, I put it into a glass bowl and set it to the side. I put a little more oil in the pan, and added another tablespoon or so of garlic. I let it brown for a bit, and then I added in the onion slices. (If I were to do it again, I would probably cut the onions a little wider and cook them for less time, but the end result was fine.) Once the onions started to cook, I added the carrots. (Carrots add not only nutrition but color and sweetness to the dish.) Then the asparagus stalks (about 1 inch pieces) and water chestnuts. When I felt the asparagus getting less crisp, I added the asparagus tips and zucchini. (Saving the green onions and kale for the last few minutes of cooking. I didn't even chop them until ready to use.) I periodically added a little more garlic (probably used the equivalent of an entire bulb by the time I was finished) and another half tablespoon of ginger juice. When the asparagus seemed to be almost done, I added the chicken back in and mixed it all up. I turned the heat down (from medium-high or medium) to medium-low or low, and then added the kale (kind of minced) and the green onions. It could have been ready at this point, but my husband still had some things to do, so I think it simmered on low for about 10-15 more minutes (also, the rice wasn't ready yet). The dish was served over rice with soy sauce (and sriracha for hubby). Perhaps this doesn't sound simple, but really it's all about stirring meat and then some vegetables around in a pan with aromatics until they're done. The flavors meld beautifully together - my husband even said that I had found a way to get him to eat asparagus. Not that I'm trying to get him to eat asparagus - more for me, if he doesn't! My daughter kept giving me her asparagus tips, but otherwise, she had two helpings. I find that water chestnuts encourage even the pickiest eaters to eat vegetables - they are so much fun to eat! Also, my daughter helped to grow the kale, and she is proud to eat it. What are some of your favorite ways to get your family to eat vegetables? Yes, I know it's been a while since I posted here. It was intentional. We just had an unexpectedly busy month. Among other things, my daughter and I spent a week and a half at my parents' house, which meant a lot of preparation and a lot of decompression when we got home. I'm looking forward to a more productive May. If you have stopped by in the last week or so, you may have noticed some changes. I have my own domain now, so in order to avoid getting redirect messages, you will need to change your links to: http://blog.funmama.net/. Stay tuned for new things coming soon. I am blogging without obligation, but I also intend to write on this blog again soon. Until then, I hope you'll check out Mommy Brain. Thanks! I mentioned a few weeks ago that I would soon make an exciting announcement (again, nothing to do with expanding my family). Today, I am finally ready let tell everyone. I have started a new blogging venture at What to Expect, a pregnancy and parenting website. I applied for this position and was accepted several weeks ago, but I needed to work out all the details before I could share here. I will still be blogging here at Fun Mama. My new blog has a slightly different focus, and shouldn't take away from anything here. I hope that you will come visit me at What to Expect too, though at my new blog Mommy Brain - Because Postpartum is Forever . I will make an announcement here when I post anything there, but What To Expect does have an RSS feed so you can subscribe to my new blog too. My first piece, Mommy Brain - Day Filled With Mishaps , is already available. If you would like to comment, you will need to create an account at What to Expect. I will return soon with a regular topic! 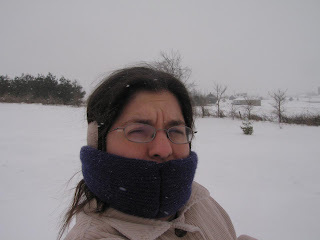 That's me hanging out in the snow during our snow day on Valentine's weekend. I let my Mama wear my hat, so I had earmuffs and some knitted face muzzle thing (I think it's supposed to be earmuffs too). 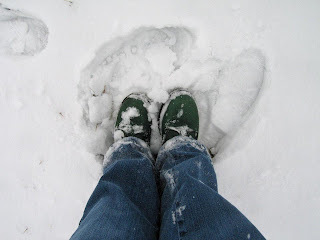 I love the way my green Doc Martens look in the snow. And I love that I have an excuse to wear them ten plus years after their purchase. I have created a fan page for this blog on Facebook. If you are on Facebook you can do a search for Fun Mama or you can just go here. If you become a fan of Fun Mama, you will receive updates on postings in your newsfeed. You will also be able to more easily recommend the blog to your friends or just share a single post if you wish. Please don't feel like you have to join Facebook if you aren't already a member. I intend for the conversation to stay here. I will occasionally be linking to previous posts that I think are relevant, but those will also show up on twitter (which will, in turn, show up in the sidebar). If you are on Facebook, though, please feel free to spread the word about Fun Mama! 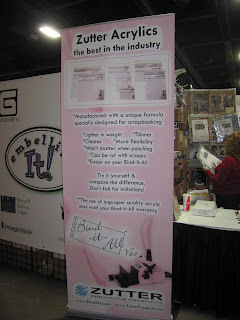 On Friday, February 26 I got to attend the Creating Keepsakes Convention in Louisville, KY. This is the second year that the CKC came to Louisville, and the second time that my sister-in-law and I got to attend (and dragged my daughter along with us). Last year, we made it through the vendor fair in about 2 hours. We were kind of disappointed at the lack of vendors. I've spent the last year kicking myself for not buying the Bind-it-All by Zutter when I had the chance, though. The vendor had such a great deal, and I had wanted one for so long. So I saved my pennies and made a bee-line for the Scrapbooks 'N Stickers booth (I would link, but their site is down right now). It was still a hard decision to make, but in the end the ability to make my own spiral-bound books won out. Isn't it cute? I haven't had the chance to use it yet, but I did try it out at CKC (there was a make-and-take). It is so simple to use. Just choose your papers, punch the holes and add the binding. I'm hoping to do a little video eventually showing you just how simple it is to use. They also make special papers that work with the Bind-it-all system - double-sided and cute (see in above photo). I have enough paper to last me for a while, so I passed (for now). I did pick up a few covers (front and back pages). I'm especially excited about the canvas cover. I'm thinking I could play with my perfect pearls and do some watercolor type stuff. 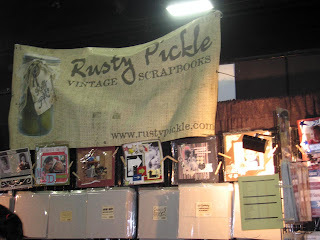 Rusty Pickle, who is going out of business, was there selling almost everything at 50% off. I was able to pick up a couple of class kits from years past, and some Captain Jack pirate paper. Anyone know where I can get a picture of Johnny Depp in full pirate regalia? I think I need to document my love. I have always loved the Rusty Pickle look, even though I've never figured out how to do it myself. I'm sad to see them go. We didn't take any classes this year (or last year) in part because we have a toddler to pass back and forth but also because none of the classes especially appealed to us. I was sorry I didn't sign up when I saw this display in the lobby though. I've been wondering what happened to Chatterbox and Melody Ross (if you know, please fill me in, apparently I'm not in the loop). 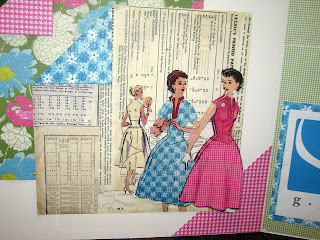 Well, Melody Ross is apparently designing a super cool paper line based on old fashioned paper patterns. 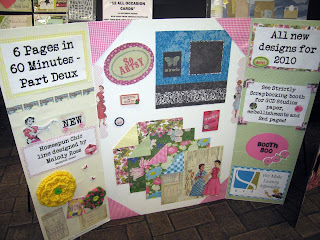 How fun to see two of my obsessions come together like this (scrapbooking and sewing, in case you didn't follow). 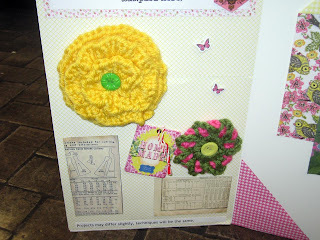 Check out the crocheted flowers! I don't know if they are part of the line or not, but they make me want to pick up my crochet hook again. Is anyone willing to teach me to make a flower? Love these pattern patterned papers! Someday soon I'll tell you all about how the dreaded "mommy brain" reared its ugly head this day. Whew! Don't you just love girls' days? Edited to add: I forgot to mention that there were probably twice as many vendors at CKC this year than last year. Last year, we spent about two hours walking around the fair. This year, we spent four hours taking everything in! I'm really glad that the vendors are starting to see the benefit of coming to Louisville. hosting my parents, brother and sister-in-law for a long weekend in which it snowed both at our house and at theirs down south. Poor sister-in-law had to miss the 8 inches of snow at her house in order to get to mine! writing a novel. So not finished yet. See above stomach virus. So, I could have handled two or three of these things with no problem. But frankly, getting sick completely wiped me out. I did manage to meet my word count on my novel the night that I got sick (I was SO impressed with myself), but since that night haven't managed to pick it up at all. I'm hoping that making that admission here will shame me into trying again. I was doing really well on LOAD until the night my daughter got sick. After that it was just too much to face to not only do the layout but take a photo of it and upload it to the computer. I seem to be back on that wagon though. PS. I was getting a lot of spam in comments, so I disabled anonymous commenting. If this is going to be a problem for you, please send me an email and let me know. It seems the only anonymous comments I was getting were selling things I don't want, though. I have written 14,302 words on my novel as of Saturday night. Granted, this was as of 2am so technically it was Sunday morning, but if I'm still awake I don't consider the day over. Got clothes washed and laid flat to prepare for the next stage in consignment prep. Took Abigail to the jumpy place for an afternoon. Met a new friend and introduced Abigail to a new friend. Did not make a dessert no matter how much I wanted to. Doesn't mean I didn't eat sweets, but I didn't feel obligated to eat something I'd taken the time to make myself. What were your small successes last week? Outside my window... about six inches of snow, give or take an inch. I am thinking... about making space. I am thankful for... not having a reason to go outside. It's beautiful, but I don't want to be cold. I am wearing... pink Scottie dog pajama bottoms and an Atlanta Semester tshirt from college. I am remembering... fun times I had in the snow when I was a child. I am going... to have eat another toffee soon. I shouldn't have made them yesterday! I am reading... two writing books - The 4am Breakthrough and How to Write a Damn Good Myth-based Novel. I am trying not to start reading another novel until I finish the first draft of my own. I am hoping... the weather doesn't affect my parents' plans to come see us soon. On my mind... my novel. Constantly. From the learning rooms... you really don't need to know the plot ahead of time before you start to write. It's amazing. I wish I had known these fifteen years ago. From the kitchen... saltine cracker toffee. Perhaps I should start a pot of veggie soup to counteract the effects. Around the house... stacks of clothes waiting on their fate. One of my favorite things ~ saltine cracker toffee. Yum! A few plans for the rest of the week: going out for Indian food; looking for seeds for the garden; maybe trying Ethiopian food; getting more words down. 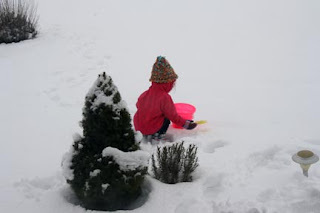 A photo of today: A playing in the snow that fell overnight and this morning. We use her sand bucket year round! PS. This may be the first time in the history of this blog that I have posted a photo taken the same day. At least one that is about the day in question. Labels: I Want to Scrapbook This, seasons - winter, Today. . . I haven't mentioned my one word in a while. My word for 2010 is courage. I have several reasons for that, but one of them is my writing. It takes a lot of courage to write. I know that may sound weird, but it can be daunting to sit with a page in front of you and not know what the next words are going to be. I have wanted, attempted and failed at starting a wriring career for over ten years now. I started a novel about twelve years ago and when I couldn't figure out what to say after 10 pages, I gave up. I wrote a column for an online scrapbooking magazine about six years ago, and when it went under, I didn't try to look for anything else. It can be so nerve-wracking to write something and not know if anyone is going to read or will ever want to read it. It can be overwhelming to think that you can spend years working on something and that you will just throw it under the bed in the end because it's so awful. So why bother? It takes courage to bother. I have decided that it doesn't matter how terrible my first draft is, or how hard it is to keep going. I can only work a second draft if I have a first draft! With that in mind, I am using February to embark on a "novel in a month" project. I got the idea from NaNoWriMo (National Novel Writing Month) which is held in November. November is a busy busy month anyway, so I don't think I would get anything done, not to mention that's ten months away. I am summoning courage NOW. February feels like the longest darkest month of the year, so I thought I'd try this challenge before I hear the siren call of the zoo or something (you know, when it warms up?). I don't know what's going to happen with this. I imagine it may mean less blogging this month. I'll do my best. I'm also participating in LOAD, which will take a little bit of extra time too. We also have family visiting for nearly a week at some point. And February is the shortest month of the year. I gave myself a couple of extra days, and started my novel on Friday, January 29th. My final goal is 50,000 words. As of this morning, I have approximately 5116. (I'm writing longhand, so my count may be off). I'd love some support from readers, so please feel free to comment with some "Go, Deanna, go!" energy. No "what are you thinkings" if you please. At least wait until I've finished. Even if I don't get a chance to blog regularly, I will try to pop in now and then with a word count or a status update. If you'd like to join me in my quest, please let me know. I think mutual support would be wonderful.